My name is Margaret Bramlett. My husband, Larry, and I live in a small country setting just outside Diamond Missouri. with children and grand children living close by. Because we live in the country our boxers have two and a half acres to run and play in. My love for the Boxer breed first started when I was seven years old. Thats when Mitize my first boxer came to live with us. She was a wonderful and loyal childhood friend. We had many wonderful times till old age took her away after sixteen years of freindship. I got my first paired set of boxers in 1989, and that was the start of Boxerlane. We started raising Boxers in 1991 with the first litter that arrived. 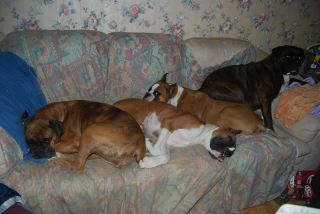 We love the Boxer breed and strive to keep our boxers within the Akc standards. We are not a puppy mill, my dogs are loving members of our family. That said, we would never knowingly sell to people who do not have the best intentions for our puppies. Boxers are wonderful pets, but before you get a boxer you should know if this is the breed for you. Every breed of dog is unique in it’s own way. 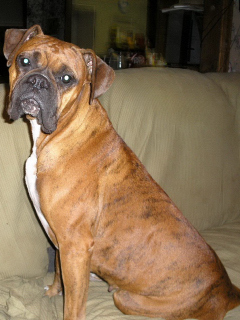 Boxers are active dogs, they love to be with you all the time, and are great with kids. My grandkids learned to walk by holding onto my boxers. Boxers are clowns, and do silly things to make you laugh, and they stay clowns well into old age. They don’t do well in extreme hot or cold weather so they need to be inside with you. They love people and are very smart. It is a very big responsiblity raising a puppy. They depend on you for their every need and lots of love. If you decide a Boxer is right for you Great! You won’t regret it and they will love you till the day that they die. They are truly loyal dogs.